Head-of-line blocking (HOL blocking) in networking is a performance issue that occurs when a bunch of packets is blocked by the first packet in line. It can happen specially in input buffered network switches where out-of-order delivery of packets can occur. A switch can be composed of input buffered ports, output buffered ports and switch fabric. When first-in first-out input buffers are used, only the first received packet is prepared to be forwarded. All packets received afterwards are not forwarded if the first one cannot be forwarded. That is basically what HOL blocking really is. As the time goes by and the network with more and more virtualised servers and other devices are making that network more complicated, overlay technologies are rising to save the day for network administrators. Virtual Extensible LAN – VXLAN is a new encapsulation technology used to run an overlay network on current Layer 3 communication network. An overlay network is considered as a practical network that is set up on the top of current layer 2 network. It also considers additional layer 3 technologies to aid flexible computer architectures. VXLAN will make sure it is very easy for network engineers to level out the right cloud computing setting while reasonably separating cloud applications and tenants. A cloud computing environment is defined as a multitenant, every tenant needs its separately configured logical network, which in return needs it’s very own network ID or identification. What the hell that means? What it this VXLAN doing actually. To put it simple, VXLAN can create logical network to connect your virtual machines across different networks. It is enabling us to make a layer 2 network for our VMs on top of our layer 3 network. That’s why VXLAN is a overlay technology. In “normal” network if you are connecting virtual machine to get the connection to some other virtual machine on different subnet, you need to use a layer 3 router to make a connection between networks. With VXLAN we can utilize VXLAN gateway of some sort to connect them without even exiting into physical network. 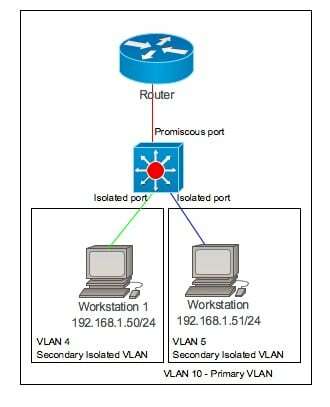 In the article VACL – VLAN Access Lists we mention one way how to provide security on switch device like Cisco Catalyst switch. In this article we will see the other way of providing security with use of private VLANs – PVLAN. The whole idea is to make possible to group VLANs inside the VLANs. You see from the picture here on the right that this will give you the opportunity to make group od computers or servers inside main (primary) VLAN. It will be possible to have two servers in the VLAN 10 and both of them on the same subnet. Here it becomes little bit strange, then they can be separated into two Secondary VLANs, VLAN 4 and VLAN 5.